He tripped on his Crocs (I'm never buying Crocs for my child again), and fell forward. 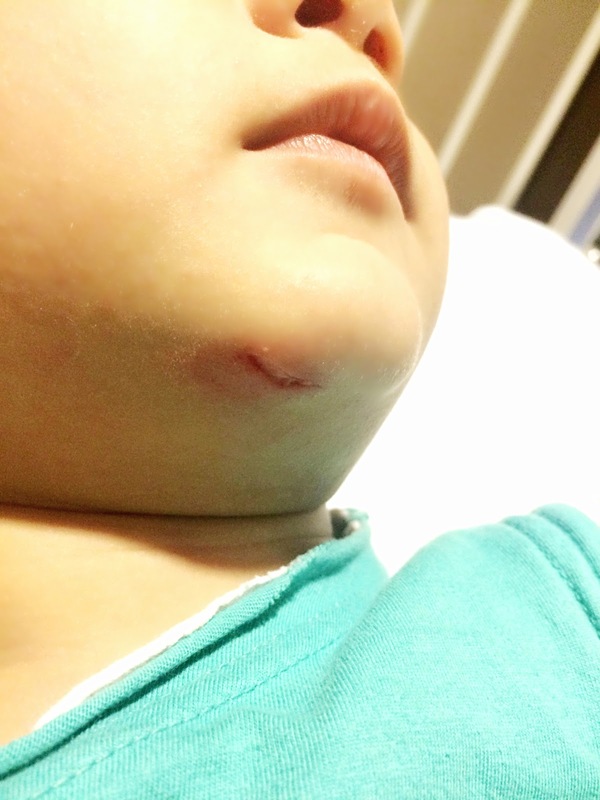 It would be fine if he fell on the playground's soft surface but unfortunately, his chin landed on a metal ladder, resulting in a laceration. It was bleeding profusely from his wound. Thankfully, there was no panic as my 2 sisters are nurses as well. We tried to stop the bleeding but it was probably very painful and my son kept fidgeting so I quickly brought him back up to my home, rinsed the wound and covered it with a dressing. It stopped bleeding. After inspecting the wound myself, I felt he needed stitching as it was pretty deep and long. It was late at night, about 7pm, so I decided to bring him to a private hospital instead for stitching and also to be warded a night for observation. 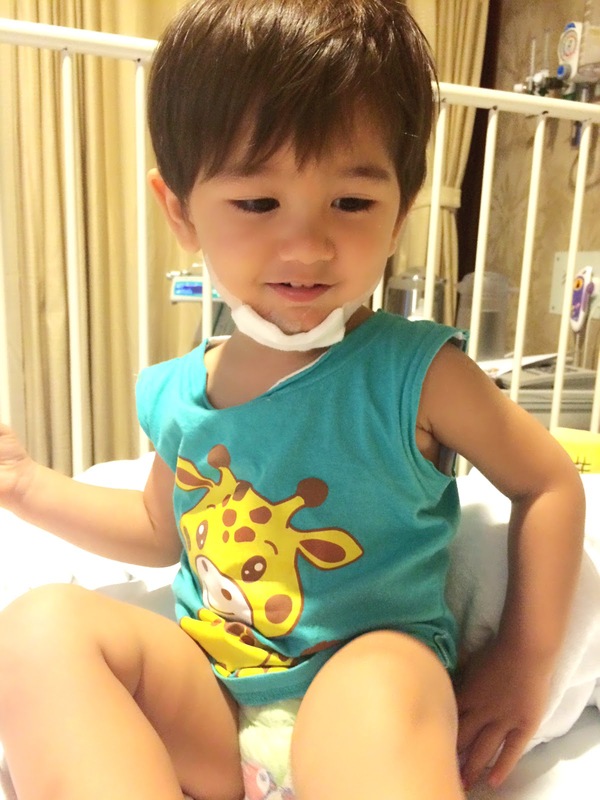 General hospitals would have a long waiting time and he might not be able to be warded. Because I went to a private hospital, I chose a single bedded room. I was also given a choice to get a plastic surgeon to do the stitching instead for minimal scarring. 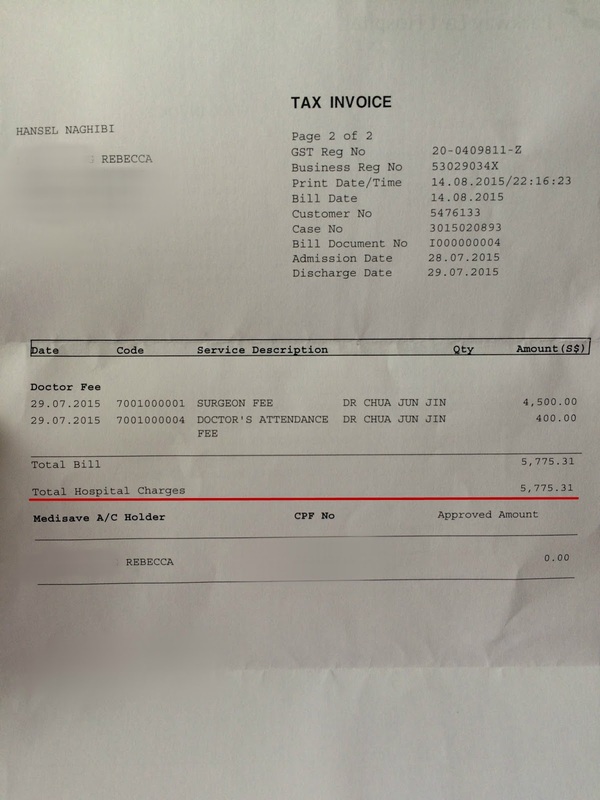 The A&E doctor informed me that the doctor's fee for a plastic surgeon would be the least 4.9k! I was appalled at the fees! Even a double eyelid surgery in a private clinic wouldn't cost that much! 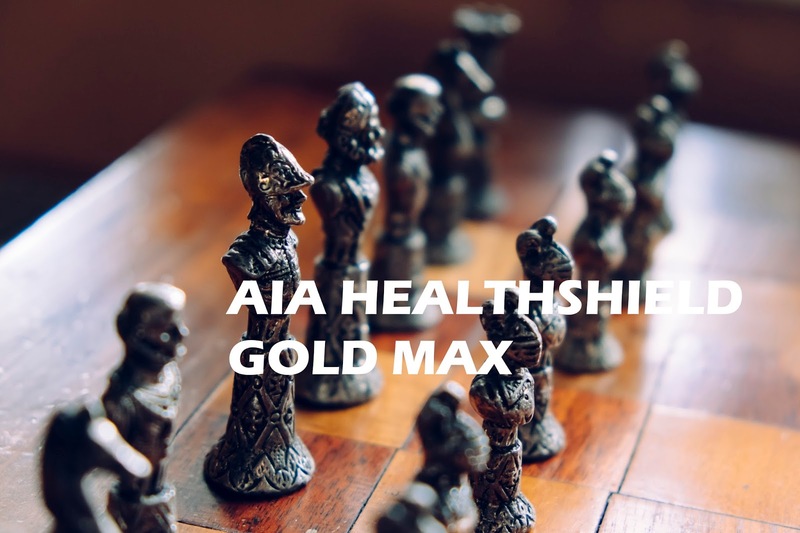 But I went for it anyway, as my son is covered by AIA Healthshield Gold Max A + Essential A. So the procedure was done very quickly at about 12am that same evening. This is my brave little bubba after the procedure. The doctor said that we will be able to discharge the following morning 11am. So we slept throughout the night. When we woke, the nurse informed me that Hansel is ready for discharge and I can go and make payment before the discharge. I went down to the payment counter and received the bill. For 5 stitches and less than 24 hours stay. Thank God for AIA and my bestest, young (but older than me haha), motivated, meticulous and efficient insurance agent Lloyd Hong. 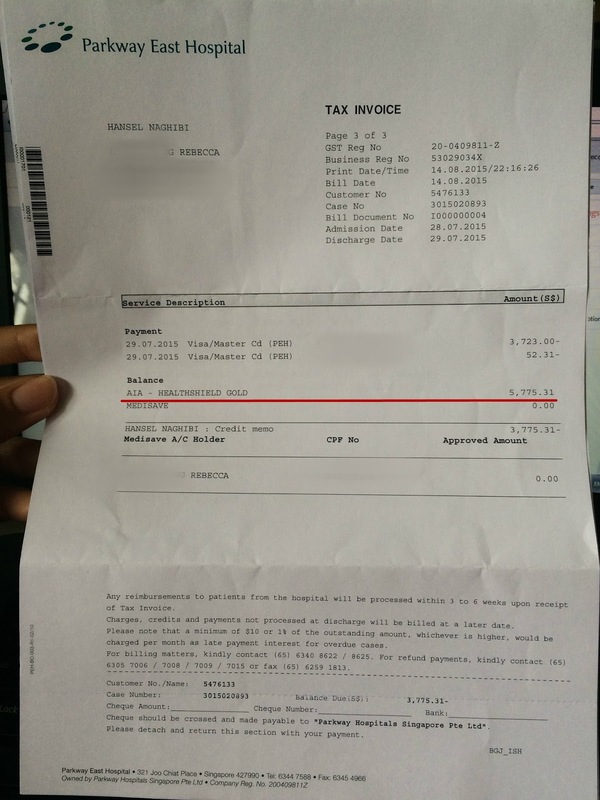 The e-filing notice and reimbursement was gone through and done so smoothly and fast. $5,775.31 reimbursed! Not a single cent less. This also actually wasn't the first time my claim went so smoothly. I have been to the hospital for dengue with the bill amounting to around $5k, another time for investigation of back pain amounting to $7k and my son's prolonged high fever for about $3k. All these claims were processed smoothly and 100% reimbursement done promptly. I got the Gold Max Essential A rider, because there is 100% reimbursement and I get to choose to go to private hospitals where the waiting time is shorter compared to general hospitals. It is especially useful as you cannot foresee when an emergency accident will happen to you or your child or when you will be diagnosed with an illness. Take this incident for example, so many eyes but we couldn't stop the accident from happening. I feel that paying that few extra hundreds a year for myself and my son was really worth it. This incident really made me glad I made the right choice with the right agent. 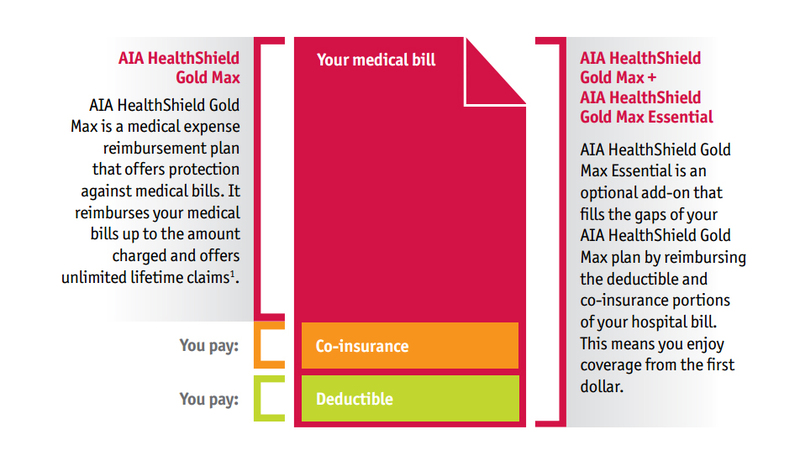 You can read more on the AIA Healthshield Gold Max plans here.